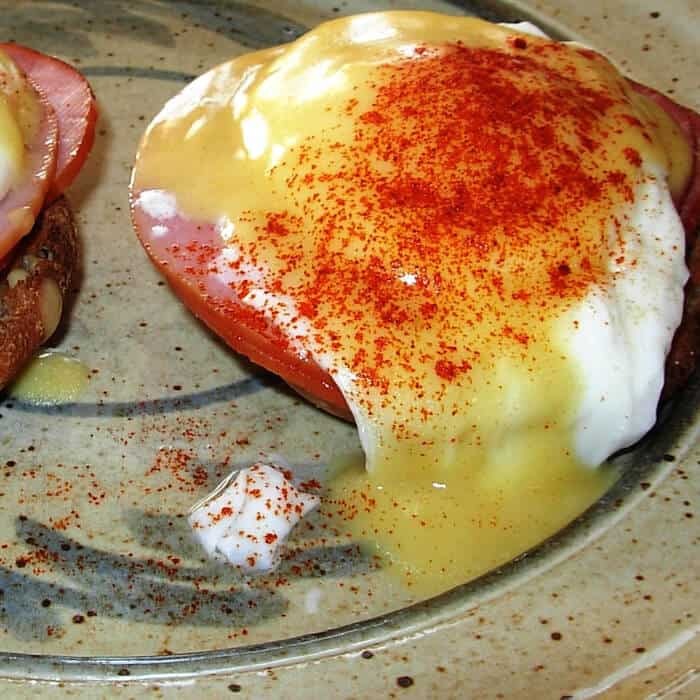 This Easy Eggs Benedict Recipe uses English Muffins and packaged Hollandaise Sauce. 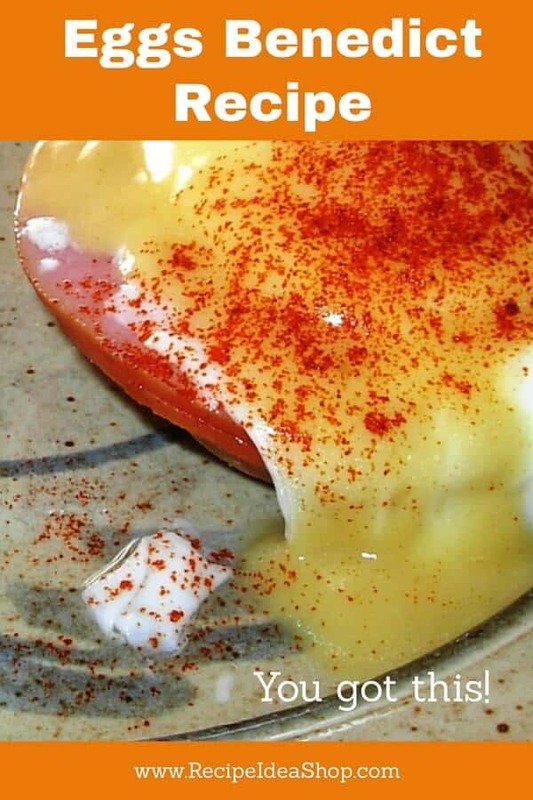 Eggs Benedict is a favorite special breakfast in many homes. You don’t have to go to a restaurant to eat this amazing delight! It’s basically a toasted English Muffin, topped by Canadian bacon, a Poached Egg and a bit of Hollandaise Sauce. Hi. It’s Lois in the kitchen at Recipe Idea Shop. Eggs Benedict is one of my favorite breakfast meals. You just can’t beat the delicious combination of flavors and proteins. This dish looks beautiful on a plate and is not hard to make, especially if you cheat and use a high-quality packaged Hollandaise Sauce, such as Knorr’s Hollandaise Sauce. It’s as simple as making poached eggs and toast. You start with Poached Eggs and a good English Muffin, like Bay’s English Muffins or Homemade English Muffins (Don’s English Muffins), add thin-sliced Canadian bacon and some Hollandaise sauce. For a change of pace (and one I much prefer! ), try substituting Smoked Salmon for the Canadian bacon. Eggs Benedict over English Muffins with Hollandaise Sauce is a favorite special breakfast in many homes. You will feel decadent when you eat this toasted English Muffin, topped by Canadian bacon, a Poached Egg and a bit of Hollandaise Sauce. Make the Hollandaise Sauce according to the directions on the package. Knorr's Hollandaise Sauce calls for a cup of milk and 1/4 cup of butter or margarine. It makes enough for 4-6 servings, and takes about 15 minutes to make. Heat a deep skillet or pot of water. Break the eggs into the boiling water. To prevent sticking in the pan, add about 1 tablespoon white vinegar to the water. Turn the temperature down to medium. If the eggs are not entirely submerged in the water, ladle or splash the hot water over top of them until they are done to your standards. I like mine runny, so it doesn't take long, maybe 1 minute. If you prefer them a bit harder, just cook them longer until they look to be about the doneness you prefer. While the eggs are cooking, toast the muffins and heat the Canadian bacon for 15-20 seconds in the microwave. Put 2 slices of Canadian bacon on top of each muffin half. Scoop the eggs out of the water with a slotted spoon and let them drain over the pan for a bit. Add them to the top of the bacon. Spoon a little sauce over top and sprinkle with paprika to make it pretty. NOTE: Don and I have not mastered making homemade Hollandaise Sauce. We find that the Knorr's packaged sauce works well. 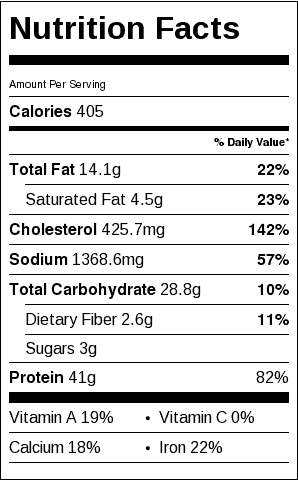 Easy Eggs Benedict Recipe Nutrition Label. Each serving is a whole muffin and 2 eggs.